So is this procedure really worth it? The beauty blogging world can't seem to get enough of microblading, and we can see why. Although plenty of women admit to its terrible pain and hefty price tag, it has also proven to turn up noticeable results with fuller eyebrows that rival Solange's. So is this procedure really worth it? 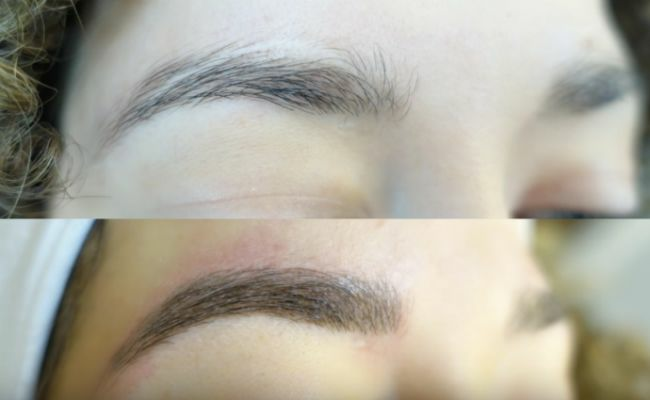 According to New York City-based microblading expert, Piret Aava, whose nickname is The Eyebrow Doctor, "microblading is a form of tattoo artistry where pigment is implanted under your skin with a manual handheld tool instead of a machine." Using small "hair-like strokes," to mimic eyebrow hair, this procedure is meant to make them look more fuller and natural, versus a store-bought pencil, wax, or gel. The handheld tool doesn't go as deep into the skin as a typical tattoo, but it is meant to be a semi-permanent solution to mask any lack of growth in certain areas in your desired eyebrow shape. The typical lifespan of a complete microblading procedure is three years. To prepare for your first microblading session, stop taking aspirin and using retinol in your skincare routine, as these things thin the skin out and cause easy bruising and bleeding. Since the reviews are all over the board as far as pain is concerned, take a some ibuprofen an hour or so before your appointment just in case. That way, you will not be in complete agony throughout the procedure. After your first session, you'll be able to determine your personal level of tolerance, just like with a regular tattoo or piercing. However, if you can tolerate a continuous, tiny scratching feeling for up two hours at a time, microblading will not be as bad as you think. It might also be comforting to know that most microblading pros use a numbing cream to help ease the discomfort. Microblading takes anywhere from 45 minutes to two hours per session, and according to microblading expert, Nicoleta Palmer, who is referred to as The Eyebrows Queen, costs anywhere between $1,200 to $1,500 for a full procedure that includes a consultation, first session, and from one to three touch ups at one-month increments. In other words, don't expect immediate results--patience is key. Share your experience with us below. If you're on the journey to thicker brows, read 4 proven ways to grow your brows and lashes naturally.